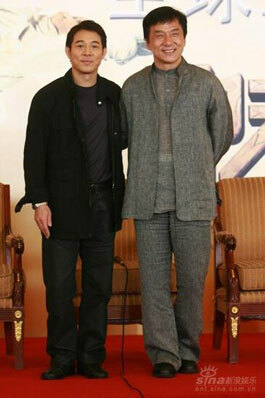 The cast and crew of Chinese-American movie The Forbidden Kingdom met the press in Beijing on April 14. The film features two Asian action superstars Jackie Chan and Jet Li, hence the buzz. Besides the duo, also attended the event were director Rob Minkoff, action choreographer Yuen Woo Ping, and also actresses Liu Yifei and Li Bingbing. Image by Sina [Cn]. The movie revolves around a kungfu-obsessed American teenager (starring Michael Angarano) who somehow time travels back to ancient China. There he meets with some martial art masters and join their quest to free the Monkey King, and presumably save the world too. Trailer here. Frankly, I am not fond of the storyline, it sounds cheap. Still, having Jackie Chan and Jet Li in the same movie is enough to get me into the cinema. Hope it’s not a flop.